Phoslab Environmental Laboratories is a leading Florida environmental testing lab that is uniquely qualified for state-wide testing. The diverse Florida physical and industrial landscape presents different testing needs along the way from the panhandle to Miami. Phoslab offers accurate and fast environmental testing services to meet the needs of manufacturers, handlers, operators, and municipalities in each of these locations and across the state. Phoslab Environmental is equipped to handle all of these needs and more. We have been serving clients across Florida for half a century and are certified and accredited by the State of Florida Department of Health. We have also been recognized for accreditation by NELAP and approved by the State Surgeon General. Phoslab Environmental Laboratories is conveniently located in Lakeland, Florida, making it easily accessible to the entire state. Our central location – just minutes off of Interstate 4 – allows our leading Florida environmental analysis lab to offer quick and accurate turnaround even to areas outside Polk County. Phoslab’s professionals are equipped to handle the unique environmental testing needs of clients in and outside of Polk County. From the construction industry surrounding the housing surge in parts of Florida to the activities supporting the transportation and tourism industries, we offer environmental lab testing to support your business. 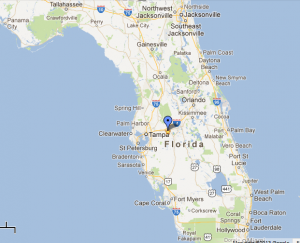 Phoslab Environmental Laboratories main facility, based in Lakeland, FL, is conveniently located between Tampa and Orlando, Florida. Our location is accessible from all parts of the state, ensuring quick turnaround time to meet your environmental testing needs. If you have a specific environmental testing need in any of these cities, we can work with you to determine the appropriate testing protocol to meet your business and compliance needs. Phoslab Environmental Laboratories is in touch with the environmental testing needs of the businesses located right here at home in Polk County. We proudly provide laboratory testing services to companies located in Mulberry, Ft. Meade, Winter Haven, Haines City, Bartow, Auburndale, and Lake Wales. Leading employers in Polk County include manufacturers, construction companies, medical device manufacturers, food production, and machining. Each of these industries requires environmental testing that meets EPA and local government standards to ensure compliance with regulations. Phoslab Environmental Laboratories is equipped to work with each of these market segments to ensure complete, accurate and compliant environmental analysis. Phoslab provides environmental testing to companies in, around, and outside of Polk County. When in doubt, speak with a Phoslab professional to ensure your testing protocol meets the applicable standards. We are dedicated to meeting clients’ needs and expectations.